Our brand-new office is full of the latest technological developments that improve dental precision and increase your overall comfort. The latest methods are changing fundamental procedures and producing new treatment opportunities. The ability to identify issues sooner, when they’re small, means less-invasive treatment and faster recovery times. Inquire today and see what these innovations can mean for you! 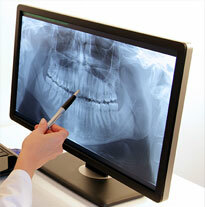 At KC Family Dental, we have moved into the next generation of X-ray technology with digital imaging. A sensor placed in your mouth allows us to capture an image directly into our computer. 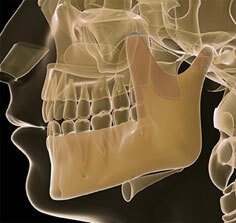 We can instantly begin evaluating the state of your dental health at the bone level. Even better, the original data can be easily stored and later overlaid with more current information to highlight treatment progress and overall changes to your dental health. Not only does this method allow us more options than conventional X-rays, but it does it all while exposing you to 75% less radiation than traditional captures. Our panoramic X-ray machine also allows us to take a single image of your entire jaw, so we can see the full structure for better evaluation and greater precision in treatment. Early detection of oral cancer means a 90% cure rate. And yet, the mortality rate has remained virtually unchanged for 40 years – one American nearly every hour dies. This is unacceptable! 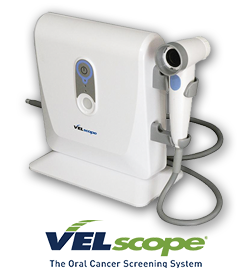 To help us safeguard your total oral health, we provide highly effective oral cancer screenings using the latest FDA-approved oral cancer screening system, VELscope™. This tool uses a specially designed light that makes any suspicious tissue instantly and clearly visible during your exam. Don’t wait! This screening could literally save your life! At KC Family Dental, we are thrilled to be one of the first practices in our area to utilize a 3-D cone beam CT digital imaging unit. This amazing three-dimensional X-ray offers excellent precision, is fast, and provides low exposure to radiation. Three-dimensional X-rays allow Dr. Brent the advantage of diagnosing her patients and evaluating their treatment options while clearly seeing their full anatomy as it exists. This promotes great precision for dental treatment, particularly implant placements and any oral surgeries. You want to make the most informed decisions possible in order to improve your dental health. Dr. Brent is making this easier with the intra-oral camera. This high-tech device is a small-scale video camera that presents a close-up picture of the interior of your mouth. You can now see for yourself what work needs to be accomplished and which teeth are in great shape. You’ll love how this works to make you an active participant in every dental decision. Nothing beats an easier, more comfortable dental visit. If you have questions about the latest dental technology, give us a call today at (913) 220-2209.